What exists beyond what we perceive as light and darkness, reality and fantasy, madness and sanity, identity and personality, brain and mind, yin and yang? The Void. . . Oddly enough the Void is anything but nothingness. 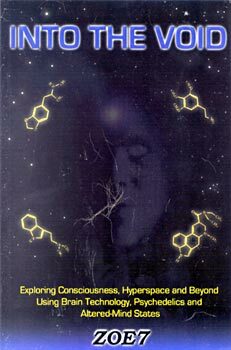 Ingest mind-expanding substances: dextromethorphan, dimenhydrinate, ketamine, psilocybin, Salvia divinorum, DMT, MDMA, and LSD. Experiment with combinations of these substances together with the latest brain technology: neuroelectrical stimulators, photo-sonic brainwave synchronizers, binaural frequencies and biofeedback devices. Engage in altered mind-states, including lucid dreaming, remote viewing, out-of-body travel and channeling. Witness the birth of Universal Intelligence, the physical dimension, and the human mind in all their glory. Enter the corridors of the deep subconscious and find yourself in the dangerous and twisted realm of psychological warps, where you will experience schizophrenia, multiple personalities, ego-disintegration and psychosis. Communicate with the algorithm and syntax concept-entities that inhabit the unconscious mind realms. Visit parallel universes and encounter creatures from alien worlds. Merge your psyche with the mind and body of people from probable Earths. Experience samadhi, nirvana and enlightenment, as your mind becomes one with Universal Intelligence and beholds the secrets behind reality itself; and much much more. Packed with startling and unprecedented never-before-published information about the nature of consciousness and the human mind, as well as with myth-shattering scientific theories and explanations on how brain technology devices, psychedelics, and hallucinogens affect brain functioning, this body of work is destined to become a classic in "New Edge" literature; and come to be regarded as a true landmark achievement in the fields of spirituality, philosophy, science and consciousness research, at a time when perhaps it is needed most -- the twenty-first century.